Socks made to let you perform better, men’s Falke RU4 Cushioned Sports Short Socks are a runner’s best friends, designed and manufactured using their ergonomic sports system. 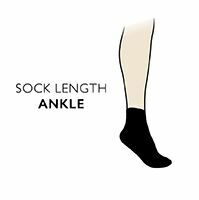 These high performance socks are anatomically shaped for a perfect left and right foot fit that places medium density loop padding exactly where it needs to be, such as the toes and cushion heel, and not where it isn’t needed, keeping the bulk low and the socks light. Woven with an open mesh structure for breathability and thermal regulation, Falke RU4 Cushioned Sports Short Socks have comfort top cuffs for fit without pressure, a flat seamed, wrinkle free toe area, inbuilt anatomic foot arches and a supportive instep band.